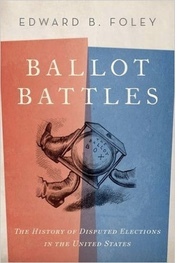 Edward B. Foley, a professor of law at The Ohio State University, is author of Ballot Battles: The History of Disputed Elections in the United States (Oxford University Press 2016). There has been much discussion in recent days of Richard Nixon’s concession of defeat to John Kennedy in the presidential election of 1960. The reason for bringing this up is Donald Trump’s hedging on whether he would concede defeat to Hillary Clinton if the preliminary returns on Election Night this year show him to be losing to her. One point being made is that Nixon conceded even though he thought, and had reason to think, that the election was being stolen from him by fraud in Illinois and Texas. According to this particular account, Nixon conceded for the good of the country despite believing he had been robbed, and the argument is that Trump should do the same even if he believes (without evidence) that this year’s election is being stolen from him. There are competing narratives, ones less willing to credit Nixon with magnanimity. There is also the claim that Nixon tried his best to uncover evidence that would have overturned Kennedy’s win, but the evidence just wasn’t there, and so Kennedy’s win was unimpeachable. The truth, in my judgment, is more complicated, leaving us more in doubt about the integrity of the 1960 election. The reason for this doubt, moreover, is important: we will never know for sure whether Kennedy won “fair-and-square” because Nixon lacked a mechanism for challenging the accuracy of the returns that showed Kennedy the winner. That lack of a legal recourse reflects poorly on America (however it reflects on Nixon himself), and affects our understanding of the relevance of Nixon’s concession to the situation today. To appreciate this point, let’s review the basic facts as they confronted Nixon on Election Night in 1960. Kennedy outpaced Nixon in both Texas and Illinois based on the initial count of ballots, and Nixon would have needed to overturn Kennedy’s edge in both states, not just one, in order for Nixon to win a majority of Electoral College votes and thus the presidency. Of the two, Illinois was much closer, with Kennedy ahead of Nixon by only 8,858 votes. Historians concur that some amount of fraud occurred in Cook County on behalf of Kennedy, but how much? There never was a full recount of the 1960 presidential vote in Illinois, but a partial recount of a down-ballot race in the same election showed that the Republican candidate had been undercounted in preliminary returns by 8,875—a number that at least suggests that Nixon might be been uncounted by similar amount. The margin in Texas was much larger, with Nixon trailing Kennedy there by over 45,000 votes. In most recount situations, a margin that large would be insurmountable. But William Rorabaugh, for example, in his half-century retrospective The Real Making of the President (2009), combs through the evidence to make the case that Nixon may have been cheated out of 100,000—possibly as much as 200,000 votes—in the state. One method of this cheating was to disqualify Nixon votes based on a technical error while overlooking the exact same technical error when made on Kennedy ballots. There is no guarantee, of course, that Nixon would have won a fair recount in either Illinois or Texas. Impartial judicial investigations in both places might well have concluded that the alleged improprieties just did not add up to enough proven problems to undo Kennedy’s win. But Nixon, unlike Al Gore forty years later, never demanded a recount of the presidential vote in either state. Why not? Given his need to win both states, Nixonknew there was no point seeking a recount in Illinois unless he also had a chance of prevailing in a Texas recount. But, as Nixon himself explained in his 1962 memoir Six Crises, “there was no procedure whatever for a losing candidate to get a recount in Texas.” Historians concur. , Rorabaugh, again, explains: “Texas law made no provision for challenging a presidential election.” Robert Caro echoes the same point: “Texas law gave the [Canvassing] Board no authority to investigate the returns.” And, of course, federal courts had no jurisdiction over such cases at the time, as Lyndon Johnson had demonstrated a dozen years earlier, by getting Justice Hugo Black to order a local federal court in Texas to divest itself of jurisdiction over the claim that Johnson’s 87-vote victory in his key 1948 Senate race was predicated on 200 fake votes added to infamous Ballot Box 13. The problem, moreover, was not merely lack of a formal procedure for challenging the result in Texas. With Johnson as Kennedy’s running-mate, Nixon had no realistic prospect that Texas tribunals, administrative or judicial, would give him a fair hearing. Texas was a one-party state at the time, controlled by Johnson-affiliated Democrats. The historian Edmund Kallina, who has investigated the details of the 1960 presidential election as closely as any other, puts the point bluntly in his own culminating retrospective, Kennedy v. Nixon: The Presidential Election of 1960: “Lyndon Johnson was not about to tolerate a loss in his state.” Kallina adds: “With a powerful political machine at their disposal and virtually no organized Republican opposition, Democrats could do whatever they pleased with the election returns.” Thus, Nixon did not press a challenge in Texas because there was no way for him to obtain a fair review the accuracy of the results in the state. Why is this important? If Nixon’s concession had occurred in the context of an electoral system that provided the opportunity for a fair recount, then his decision to forego that opportunity would have conferred full legitimacy on Kennedy’s win. After all, a losing candidate is not obligated to put the nation through the ordeal of a recount even if one is available. “I accept my opponent’s victory, and let’s put the election behind us” is an entirely appropriate response in this situation. By contrast, when an electoral system lacks a process for a fair recount, a concession is incapable of conferring the same full legitimacy to the tallied votes. “I quit because there is no means for me to prove I actually won” does not convey the same acceptance of one’s opponent as the electorate’s true choice. A well-functioning democracy recognizes the distinction between these two types of concessions. It will always be a blemish in America’s performance as a democracy that it lacked a procedure for verifying that Kennedy won more valid votes in Texas than Nixon. Not only did it prevent Nixon’s concession from providing the kind of reconciliation that such statements ideally serve, but it also caused a cloud over Kennedy’s presidency that history cannot entirely dispel. Fast-forward to today. What’s the relevance of 1960 to the situation that Trump, or perhaps Clinton, may confront on Election Night this year? If Trump thinks he’s been cheated out of victory—even if he has no basis for this belief—then he may have procedures available to him that Nixon lacked. Telling Trump to forego those procedures just because Nixon was forced to concede in the absence of comparable procedures may not be an argument Trump finds persuasive. Why should Trump give up his chance to fight on, just because Nixon had no chance to fight? Isn’t it an apples-to-oranges comparison? Thus, as the nation contemplates the possibility that Trump might attempt to invoke whatever legal procedures are currently available today for second-guessing Election Night returns, we need to rethink our reliance on the historical precedent of Nixon’s concession. Instead, the argument must be that even if fair recount procedures do exist, it is not worth invoking them—perhaps because, based on the preliminary returns, there is no remotely realistic chance of overturning the outcome (if indeed that’s what the facts objectively show on Election Night). In that circumstance, John Kerry’s concession in 2004 is the much better historical precedent than Nixon’s. Kerry could have challenged the outcome in Ohio—the procedures for doing so were available—but he looked at the numbers as saw that he had no realistic shot at reversing George Bush’s victory in the state. Yes, there were 150,000 provisional ballots, and Kerry was behind by “only” 120,000 votes. But Kerry knew that not all those provisional ballots would be eligible and, of the ones that were, not all would have been voted for him. Thus, Kerry did the right thing for America and bowed out of the race, rather taking the matter to court as he could have. It is Kerry’s concession, not Nixon’s, that is the one that Trump may need to think about. If, facing a similar situation, Trump fails to find Kerry’s example persuasive, then the nation may have to be patient while Trump makes us all wait for the completion of official vote-verifying procedures.